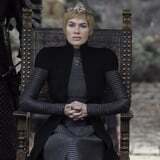 Think back to the Loot Train Battle in the season seven episode "The Spoils of War" - Cersei deals with her first major defeat, but it might not have been a total failure for the Mad Queen in training. In that episode, Randyll Tarly notes that the gold the Lannister army takes from Highgarden is already safely within the walls of King's Landing. Cersei then uses that influx of gold to pay her debts and borrow enough money from the Iron Bank to hire the Golden Company. "OK but what even is the Golden Company," you might ask? They are a sellsword company said to be 20,000 strong. Based in Essos, this band of exiles has a stellar reputation since they're known for never breaking a contract. In the season eight premiere, which aired on April 14, Euron makes good on his promise and arrives in King's Landing with the Golden Company and Captain Harry Strickland - an exiled knight of House Strickland and known in the books as "as Homeless Harry Strickland" - in tow. A dragon is responsible for founding the Golden Company, and even gold may not be enough to make them fight against the last Targaryen in the world (at least, the last one anyone knows about). Granted, their entire reputation is built on not breaking their contracts, but in the books, they compromise their motto to fight alongside a Targaryen who hasn't been a part of the show until recently - Rhaegar's supposed son, Aegon. Now that we know Jon Snow's real name is Aegon and he's the legitimate son of Rhaegar and Lyanna (and also the heir to the Iron Throne, NBD), there's an even stronger chance that the mercenaries could flip sides.